When starting out the game players are provided with their first scrap vehicle that they can then edit and rearrange in the detailed Garage feature; every vehicle can be broken down into its most basic components: frame, weapons, hardware, movement, structure, dÃ©cor and dyes. 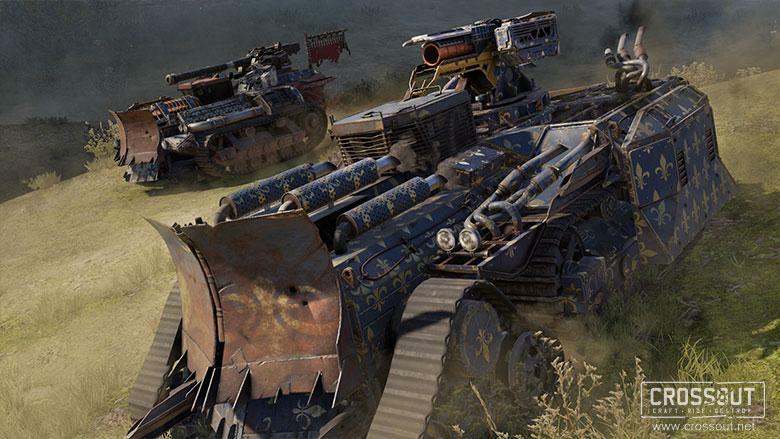 When building up a vehicle from your available components players must build everything from the general frame and shape of the machine, what type (and how many) wheels it has, what type of on-board components such as extra batteries, fuel and gadgets it will have as well as what melee and ranged weapons will be equipped. The location and positioning that components can be attached to the overall creation can vary, the ability to flip, turn and rotate parts means players can have weapons attached to various surfaces, or have armor plating covering numerous locations. New components can be acquired through completing quests or by hiring a Technician which enables players to craft rare parts using Scrap, the earned in game currency acquired through battling other players. Crafting each component takes time and will keep the specific Technician occupied for the duration, but as players level up their Camp facilities (including the Garage, Workshop, Residential and Marketplace) they can have more Technicians making items. These items can be used or even traded with other players on the Marketplace to bring in extra currency, as well as allowing players to buy items and schematics they do not have yet. Constructing a vehicle is a fun and simple affair with the powerful tools, but other than the restriction of available components players have set stat based criteria that their vehicle must fall under; Energy and TEC. Energy combes primarily of the battery house in the main cab portion of the vehicle, which has a set Energy output that is used up by hardware and weapons; the more hardware or weapons a player has or the more powerful these items are, the more Energy they will use; a vehicles hardware and weapons cannot exceed their Energy output however players can also add in extra batteries to increase this threshold. Similarly every item component, from frames, wheels and weapons, has a TEC cost and players begin with an initial TEC threshold of 310 that they cannot exceed without Camp building improvements, so as to keep battles balanced and restricts players from having an unfair number of weapons or components on a vehicle. When the vehicle is finished players are able to test drive them in a private area, check out the mobility, how the vehicle takes various terrain and inclines, and also how well it takes damage as they are able to shoot at a stationary identical version of their vehicle. Battle itself is focused on team based matches, two teams of eight where each is tasked with trying to occupy and capture the enemy â€œbaseâ€, a circled off area that when the rival team enters begins to capture it and must accrue a total of 100 seconds, the team that captures their rivals base first is the winner. Alternatively players can try to simply kill off the other team, the first team to have all its members destroyed is defeated; whether victorious or not players can still earn XP and Scrap based off their involvement and number of kills. Combat is extremely brutal, with every component and part that a player attaches to their vehicle then that component can be destroyed/removed by the enemy during battle; the difficulty depending on a vehicles overall durability, but the vehicle remains intact (even if it has no armor, wheels and weapons) until its cab is destroyed. Vehicles can also be flipped over in battle and allied team members can flip them back over if they reach them, or players can equip self-righting hardware to their vehicle.